Hi, Ben here from Benjamin Eriksson Photography and in this review I will be discussing my opinions on the newly released MeFOTO Globetrotter S Travel tripod in Carbon Fiber, sent to me by Maxxum Pty Ltd the distributors of MeFOTO Australia tripods. Canon 5D MK IV with Samyang 20mm F1.8 lens and filters. For me it’s important my tripod is easy to use, not too heavy, durable, stable and is able to easily carry any of my camera gear. Benro Precision Industrial manufactures MeFOTO tripods, they are made in China and the Globetrotter S Travel Carbon Fiber tripod comes in two colours, black and titanium. I run a variety of photography workshops around Victoria, Australia which require a tripod and work for a number of different clients; many of these situations call for the use of a sturdy versatile tripod. Like many people I am time poor, so getting things right in camera is important and a good tripod helps me achieve that. Tripods have become even more important with the introduction and use of natural density filters and larger heavier telephoto lenses. · Handy soft carry case with a shoulder strap containing the Globetrotter S in Carbon Fiber. · There is an allen key and a set of spiked feet. · The tripod has the Q2 double-action ballhead and quick release Arca-Swiss Style plate. · The tripod converts into a monopod. · The colour titanium, looks very sleek against the carbon fiber and aluminium. 4 leg sections, double center column with dual action ballhead. Easy to use twist lock legs. The Globetrotter S tripod is all about being a multi-functional light weight travel tripod. It has four leg sections, three are adjustable and two handy leg angle sliding lock positions, the Globetrotter S allows for some fantastic height and balancing adjustments. I found it very easy with a twist of a leg to easily unlock, adjust then twist and re-lock the leg on unlevelled surfaces such as rocks, sand or for getting low to the ground for say macro shots. MeFOTO supply two sets of feet - the rubber ones which are what is on the tripod out of the box, and a set of metal spike feet which are great for soft ground surfaces. These are easy to unscrew and screw in, again making it versatile for travel. The CNC machined aluminium leg lock grips feel really good in your hand, no slipping or twisting, these are an upgrade on the old MeFOTO Air and Classic tripod ranges. Locking the legs in is simple, with the leg angle lock on the centre spider/tripod body. From my experience so far, the leg adjust system keeps out unwanted elements, but with EVERY tripod on the market I would strongly recommend cleaning it every few months, if it is going to be out in the elements. The legs operate smoothly with a comfortable tactile response with just enough friction. If you hike or travel a lot, and don’t want to carry the extra weight of a Monopod then the Globetrotter S has one huge bonus! One of the carbon fiber legs on the Globetrotter S travel tripod can be removed, along with the detachable centre column and become a monopod! The handgrip is a durable hard rubber and feels good in the hand. The Monopod allows for great height flexibility too - and I'm 6’1” tall. The Monopod takes roughly 30 seconds to put together or change back into a tripod. To convert to a Monopod: At the bottom of the tripod where the hook is, it unscrews, allowing for the centre column to be pulled out (after a half turn of the centre column locking collar) from the centre of the tripod spider and attached to the monopod leg. MeFOTO use a reverse folding leg system that makes this tripod very compact; after extending the centre column, the legs then reverse to fold up around the column then ready to pack away. A centre column is extremely important on a tripod. I am always reluctant to extend the column on some tripods, and still am in certain weather conditions, no matter the tripod being used. I was certain I'd get camera shake whenever there was a slight breeze. This so far hasn't been the case with the Globetrotter S Travel tripod Carbon Fiber columns (yes columns TWO!) - it looks sturdy, feel pretty solid and should be with an approximate diameter of 28mm Carbon Fiber neck. I haven’t used the tripod in howling winds, but have used it in conditions between 5-10 knots without camera shake shooting sunsets and astro photography. My only side note for taller photographers is that, this is a travel tripod and if you are up over 5’8” tall you will probably want to use one of the two centre columns, unless you are after a low down shot, but this can be the comprise between something bigger / heavier and something smaller / lighter. Throw in the fact that many Mirrorless and DSLR cameras now have articulating screens and this might not even be of any concern. (just not on my 5D MK IV and 6D….). There is also a handy hook at the bottom of the centre column, for adding extra weight like a camera bag. I often use this handy hook. Made of magnesium alloy, it looks and feels well-made. The leg locks work effortlessly, and once disengaged (if in use), it allows for the reverse folding carbon fiber legs to be placed into position; folding away to a compact 400mm in the handy carry bag. I love that it easily fits on my Tenba Solstice 24l backpack and disperses the weight of my camera and lenses. An Allen key is supplied for basic cleaning/maintenance. The MeFOTO Q2G double-action ball head has two operating knobs: 1) Head Lock; 2) Pan locking knob. The grip on each feels great and has small ridges which mean your fingers don't slip while using them. I have used the tripod using my Canon 5D MK IV with Samyang 20mm f1.8, Samyang 14mm f2.8, Tamron 24-70mm f2.8 G2 and Canon 70-200mm f2.8 lenses. The Head locking knob and Pan lock run independently and with ease. The ball head can be moved freely, with a twist of the head locking knob, allowing the mounting platform to be positioned between 0-90 degrees vertical orientation, yet can be smoothly locked again quickly with the Head locking knob, which is important if you want to produce panoramic photos without a more bulkier pano tripod head. It comes with the industry standard Arca-Swiss style quick release plate and the quick release locking knob work smoothly together. To use it, it's simple - holding your camera, just twist the knob to release and allow the plate and camera to be moved away from the ball head. My tip for attaching the camera to the plate is to have the locking knob on the ball head facing in the direction of the lens, this keeps it away from fingers accidentally un-tightening it when you were wanting to un-tightening the Head lock knob. Hand up!! I did it once, luckily the Swiss Arca style plate has a two pins that add a little extra safety on my Classic Globetrotter CF when this happened. There is a bubble level and has 360 panning indicator numbers. Sunset down at Portsea, Mornington Peninsula. Canon 5D MK IV / Samyang 20mm f1.8 and filter holder kit. The MeFOTO Globetrotter S Travel tripod in Carbon Fiber is a sleek modern looking tripod. I like the ease of operation, its flexibility and it feels very sturdy when in use. I can grab all leg locks in one hand and give them a half turn to unlock it, and extend the legs out in one motion with ease. Moreover, the optional spiked feet and monopod options make it a excellent choice of equipment that is perfect for amateur photographers who want a great first tripod; or for travel photographers who require something light weight, compact, yet versatile with the strength to hold heavy camera equipment. It also comes with an Australian 3 Year Warranty. Any negatives? I think the bubble level should have been moved off the top plate, making it more accessible when the camera and lens are mounted on the head for panoramic photos (you need to take your camera off the tripod to use it or get it perfect then hope you don’t move the tripod at all putting your camera on). But many people use attachment levels that lock into the hot shoe. I am also 6’1” tall and while I would happily use this as my travel tripod, no questions asked, its light weight and versatile. It wouldn’t be my first choice for my everyday work tripod, with the four leg sections, needing to use at least one of the double centre columns to get to the height level I like my camera height to be. But then it isn’t aimed for that market, its aimed at traveler’s and hikers wanting a light versatile compact tripod (but still worth a mention as I want my reviews to always be a true reflection of my thoughts and my thoughts also came back to articulating screens on many cameras now). Pricing will be somewhere between $550-$600 online or in store with most Australian Camera store retailers such as Vanbar, DigiDirect, Camera Lane and some Camera House stores. Check out maxxum.com.au for more info or contact me directly. Mornington sunset that didn’t give much but tested the stability of the Globetrotter S CF on the rocky shoreline. The Globetrotter S Travel tripod in Carbon Fiber is a great pairing combo with my Canon 5D MK IV / Samyang 14mm f2.8 AF / 20mm f1.8 or heavier Tamron 24-70mm f2.8 G2, I also used it on a Product shoot using my 5D MK IV / Canon 70-200mm f2.8 USM II lens. I have used it while out on beaches catching sunsets, on rocky cliffs doing astrophotography, and on my Night Cityscape Workshop in South Wharf taking long exposure photos. It’s quick to set up: 30-40 seconds from unzipping the bag, unfolding the legs, extending and tightening the legs, and attaching to my camera via the quick release plate. Adjustments are easy for framing subjects and comes in traditional back or the very modern looking titanium colour. Will I use this in my photography kit? Yes, for sure. Always clean and dry your tripod after it has been exposed to wet, dusty, sandy or salty conditions. I use warm soapy water and then rinse it off with fresh water. Unlike some tripod brands which are fiddly when trying to remove the leg locks, the MeFOTO Globetrotter legs can simply be unscrewed to clean, allowing us end users to keep the 'twist lock' clean from dust, dirt or sand should any mange to sneak in. MeFOTO RoadTrip tripod in Aluminium with carry bag, spiked feet and allen key. Hey all, Ben here from Benjamin Eriksson Photography and this is my review for the RoadTrip Tripod Aluminium, sent to me by MeFOTO Australia. My normal day-to-day tripod is the Globetrotter in Carbon Fiber but like my last review on the Globetrotter in aluminium I put the Globetrotter Carbon Fiber aside, and have been using the RoadTrip now for the last 5-6 weeks. I shoot a variety of photographs for clients using my tripod and heavily rely on a tripod in my spare time out shooting landscapes/cityscapes both day and night. For me it’s important a tripod is easy to use, not too heavy, durable, stable and is able to easily carry any of my camera gear. Benro Precision Industrial manufactures MeFOTO tripods, they are made in China and the RoadTrip comes in 11 colours, I was sent the orange and it really PoPs! I have used the MeFOTO RoadTrip aluminium on some product shoots, using my Canon 5D MK IV and Canon 70-200 f/2.8 plus also had it out with me while out having some fun with friends in a variety of situations including the back beaches of the Mornington Peninsula and the beautiful Yarra Valley in Victoria. Again using my Canon Full Frame 5D MK IV but with the Samyang 20mm f1.8 lens lent to me by Samyang Optics Australia. I selected a few of my favorite shots taken with the RoadTrip tripod, as I feel its important to let people see a finished product (in this case a few photos) which the RoadTrip took a major part in getting. MeFOTO RoadTrip helped me capture the Aurora Australis, sunset and stars at an old tunnel in the Yarra Valley all requiring long exposures and a sturdy tripod. Canon 5D MK IV with Samyang 20mm f/1.8 lens. Out catching a sunset then some astro on an old train line. MeFOTO RoadTrip with Canon 5D MK IV and Samyang 20mm f/1.8 lens. · Handy carry case with a shoulder strap and a zip pocket inside that contains an allen key and a set of spiked feet. · Inside sits the RoadTrip Aluminium tripod (I have the Orange & Black, it really PoPs). · The tripod has the Q1 double-action ballhead and quick release Arca-Swiss Style plate. Check out the great colour range for the RoadTrip Tripod in Aluminium. MeFOTO supply two types of feet for the RoadTrip – rubber ones that come on the tripod out of the box and a set of metal spiked feet (Note: Inside the carry bag there is a little zip pocket where these are, when I received my first MeFOTO I thought they’d forgotten to include them LOL). This is great as you can use the most suitable foot option for the surface you are on. The RoadTrip has five leg sections and two leg angle sliding lock positions, this allows for height adjustment which helps when on unlevelled surfaces such as rocks, sand or getting low to the ground for say macro shots. The leg lock grips require a half turn clockwise, which allow free movement to adjust your tripod to the required height, easy set up. Follow by an anticlockwise half turn to lock the tripod legs away. Ensuring the legs are locked in is simple with the leg angle lock on the centre spider/tripod body. MeFOTO use a reverse folding leg system that makes this tripod very compact 395mm in fact; after extending the centre column, the legs then reverse to fold up around the column then ready to pack away. The legs are pretty smooth and easy to operate. A big bonus with this tripod over many of its competitors is that the RoadTrip tripod also converts into a monopod. One leg is designed to be removed, and then attaches to the detachable centre column becoming a monopod. The handgrip from the tripod becomes a handy useful monopod handgrip. At the bottom of the tripod where the hook is, it unscrews, allowing for the centre column to be pulled out (you need to half turn of the center column locking collar to remove the column). Next unscrew the leg with the handgrip. Screw the centre column and leg together and you have the monopod. Pretty straight forward and simple! A centre column is extremely important on a tripod, in my testing so far the RoadTrip in aluminum has performed well, when out shooting the Aurora Australis there was constant breezes along the coast of say 5-10 knots. On my shoots I generally don’t use the centre column fully extended, but did have it maybe a third of the way up and it was sturdy. All the Classic range of MeFOTO tripods have a groove running up the column, which I believe adds strength and rigidity. There is also a spring-loaded hook at the bottom of the center column for adding extra weight in windy conditions to stabilise, like a camera bag. Made of magnesium alloy, it looks and feels good in the hand. The leg locks work effortlessly, and once disengaged (if in use), it allows for the reverse folding aluminium legs to be placed into position; folding away to a compact 395mm for easy storage in the carry bag supplied, a roller bag or on the side of a backpack. The tripod body and centre column work well together, be it using the RoadTrip as a tripod or for a quick disassemble and reassemble into a monopod. These two components are integral in firming and creating great stability, particularly when extending the centre column up higher. An Allen key is supplied for basic cleaning/maintenance. Q1 Double-action ball head, mounting platform and quick release plate. The grip on each knob feels great and has small ridges which mean your fingers don't slip while using them. Drag control can be manually adjusted and locked, along with independent panning. The ballhead can be moved freely, yet can be smoothly locked quickly with the Head locking knob, important creating panoramic photos. The tripod mounting platform uses an Arca Swiss quick release plate, industry standard and the quick release locking knob work smoothly together. The plate has two screws that sit in grooves either side of the mounting platform, as it adds a little extra security when releasing the quick release-locking knob. · Tilt and twist to fully release and remove the plate and camera. The head has a bubble level and 360 panning indicator numbers. 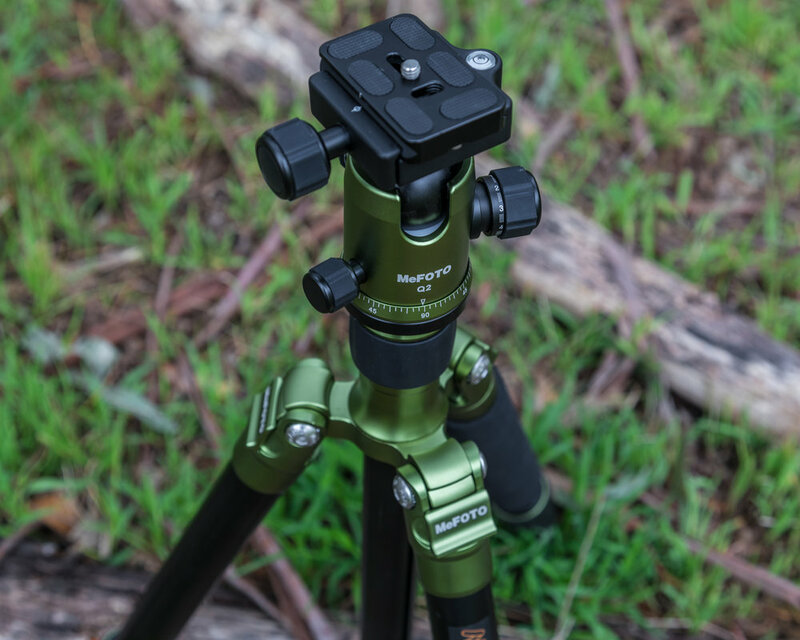 Separate head and pan lock are user-friendly additions on this tripod. The MeFOTO RoadTrip in aluminium performed well under the conditions I used it in. Now in all honesty if I were heading off hiking or travelling and wanted a slightly more compact, less bulky tripod than say the MeFOTO Globetrotter in aluminium, then the RoadTrip in aluminium would be a good option. Overall it’s a smaller tripod in folded length and circumference meaning it will fit into your luggage or pack easier than many other tripods. Like anything that is more lightweight there are trade offs, and these come down to what you will use the tripod for. RoadTrip carries up to 8kg of camera and lens and being realistic that means it would carry with ease my Canon 5D MK IV with my 150mm-600mm telephoto zoom lens but personally I wouldn’t use it with the telephoto unless on the monopod or tripod in very calm conditions. I would happily use it with any of my other range of lenses, 14, 20, 24-70, 70-200, 24-105, 15-30 or 50mm. Shooting with a Mirrorless camera or smaller to medium sized DSLR camera then take note, this should be a serious contender on your list if weighing it up against other tripods. Price point around $359 online and in store from reputable Australian retailers, offering a 3 Year Warranty. When you think about it, the RoadTrip is terrific value for money for a tripod that can be quickly transformed into a monopod. I’m not a fan of where MeFOTO place the bubble level on their tripods but it really doesn’t bother me either, I think moving it off the top plate would just add an extra plus to an already great product. With the leg locks just don’t over-tighten them, about half a turn has them locked into place ready to go and I always remember the saying ‘righty tighty, lefty loosey’. · Price I think is very reasonable at around $359 for a tripod that can carry up to 17.6lb or 8kgs of camera, lens and has the flexibility of a monopod option. · Weighs 3.6lb / 1.63kg that’s pretty lightweight. (NOTE: there is a Carbon Fiber version, which sheds even more weight 3.1lb / 1.42kg but I haven’t used it. I imagine for a serious long distance hike or for someone travelling lots where airlines charge like wounded bulls on excess baggage then spending the extra on the Carbon Fiber could be a big plus). · Ease of operation - half a turn to unlock and lock legs for quick set up or pack up and each operation is a smooth motion. · Center column has a tongue and groove adding rigidity. · Quick to set up: 30-40 seconds from unzipping the bag, unfolding the legs, extending and tightening the legs, and attaching to my camera via the quick release plate. · Colours and lots of them. I read debates on tripods all the time; everyone has had their own good and bad experiences with different brands. The MeFOTO RoadTrip wouldn’t necessarily be the tripod of choice for full time pro photographers or enthusiasts but it is a solid performer and also doesn’t cost a $1000 - $800 - $600 or even $400! What it does offer is a flexible sturdy performer that can be used with a range of varying sized cameras that doesn’t break the bank. It is totally worth considering when searching for a new tripod and in the RoadTrip tripods case also offers the convertible monopod all in one neat bag. Pop me an email and I can point you in the right direction or get in contact with one of the stores below. Always clean and dry your tripod after it has been exposed to wet, dusty, sandy or salty conditions. I use warm soapy water and then rinse it off with fresh water. Unlike some tripod brands which are fiddly when trying to remove the leg locks, the MeFOTO RoadTrip legs can simply be unscrewed to clean, allowing us end users to keep the 'twist lock' clean from dust, dirt or sand should any mange to sneak in. This is a review for the Globetrotter Tripod Aluminium, sent to me by MeFOTO Australia to lend out to other photographers when I am running various workshops and or photography meet ups. I decided I’d add it to my kit and keep my Globetrotter Carbon Fiber aside, and see if the 500 grams of weight difference would stop me from wanting to use it (that’s your average tub of butter). Every other spec is pretty much the same. For me I’m after a tripod that is easy to use, not too heavy, durable and is able to easily carry any of my camera gear. Benro Precision Industrial manufactures MeFOTO tripods, they are made in China and come in a range of cool colours. One of the most extreme spots that I have used the MeFOTO Globetrotter in aluminium is down on the reef beds of Dragons Head Rye No. 16 Beach, Mornington Peninsula, Victoria. For those unfamiliar with the location, it is only accessible at low tide and exercising caution is required due to rogue waves, hidden rock pools, and the constant flowing water moving across the reef bed and around your tripod legs (except during a very low tide). This session of testing the Globetrotter was a night shoot for astro and steel wool spinning photography so a sturdy tripod is a must. I have also spent time taking photos in a few paddocks with beautiful foregrounds and starry night backgrounds plus in my favorite city, Melbourne capturing long exposure shots in bluestone laneways, concrete walkways and old uneven timber wharfs. Handy carry case with a shoulder strap and a zip pocket inside that contains an allen key and a set of spiked feet. Inside sits the Globetrotter Aluminium tripod (the one is Green & Black, it looks really good) that can handle up to 26.5lb or 12kgs of camera, lens and accessories; featuring a minimum height of 415mm, a maximum height of 1630mm, it’s pretty lightweight for an aluminium tripod weighing in at 4.6lbs or 2.08kg. The tripod has a double-action ballhead and quick release Arca-Swiss Style plate. The tripod converts into a monopod. Having five leg sections and two leg angle sliding lock positions, the Globetrotter in aluminium allows for height adjustment which helps when on unlevelled surfaces such as rocks, sand or getting low to the ground for say macro shots. MeFOTO top it off with supplying two sets of feet - the rubber ones which are what is on the tripod out of the box, and a set of metal spike feet which are great for soft ground surfaces and easy to change over. The leg lock grips require a half turn clockwise, which allow free movement to adjust your tripod to the required height, easy set up. Follow by an anticlockwise half turn to lock the tripod legs away. Ensuring the legs are locked in is simple with the leg angle lock on the centre spider/tripod body. After a few trips out on the beaches and getting water washing over the lower sections of the legs, the leg adjustment system has kept out I’d say 95% of unwanted elements, but a wash under clean water got rid of the bit of sand. MeFOTO use a reverse folding leg system that makes this tripod very compact; after extending the centre column, the legs then reverse to fold up around the column then ready to pack away. Like the Globetrotter in Carbon Fiber I have found the legs smooth and easy to operate. 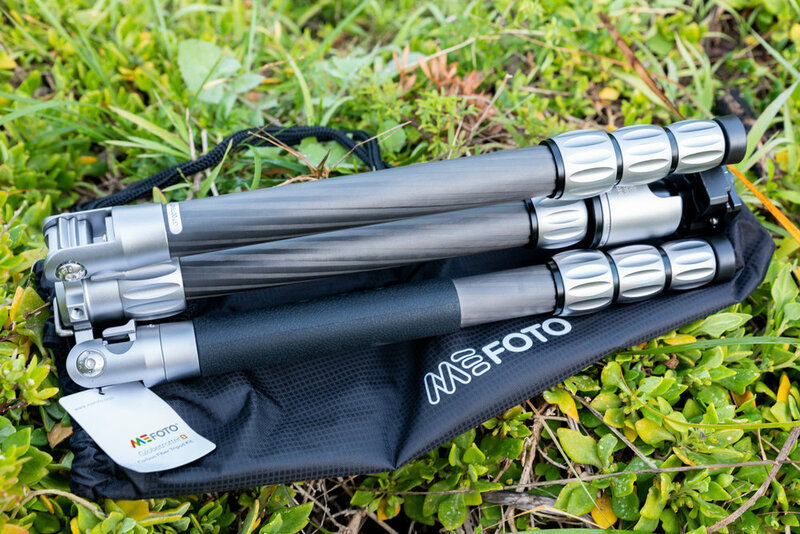 The Globetrotter in aluminium is also a monopod. One leg is designed to be removed and with the detachable centre column and become a monopod, the handgrip from the tripod becomes a handy useful monopod handgrip. The monopod allows for great height flexibility too - I'm 183cm tall! The centre column is extremely important on a tripod, however in the past I have been reluctant to extend the column at all on some tripods, as I was certain I'd get camera shake whenever there was a slight breeze. In my testing so far the Globetrotter in aluminium has performed to my expectations, the column is of a decent circumference - it looks and feels sturdy. I haven’t had it fully extended while out shooting but have had it about half way and had no issue. One of the first things I noticed when using the tripod was the tongue and groove running up the column, which I believe adds a huge amount of strength and rigidity that is so important when out in the field. I know I have already talked about the monopod function of the tripod in the legs section, but I'd like to quickly touch on it again. At the bottom of the tripod where the hook is, it unscrews, allowing for the centre column to be pulled out (after a half turn of the center column locking collar) from the centre of the tripod spider and attached to the monopod leg. It's simple and took me under 30 seconds without rushing. Leg locks engage and disengage easily. Made of magnesium alloy, it looks and feels well-made. The leg locks work effortlessly, and once disengaged (if in use), it allows for the reverse folding aluminum legs to be placed into position; folding away to a compact 420mm in the handy carry bag. Let's not forget here about the tongue and groove incorporated in the Center Column Locking Collar. I've spoken about the correlation between the tripod body and centre column - these two components are integral in firming and creating great stability, particularly when extending the centre column up higher. An Allen key is supplied for basic cleaning/maintenance. Q2 Double-action ball head and mounting platform. Just like the Carbon Fiber version of the Globetrotter, the grip on each feels great and has small ridges which mean your fingers don't slip while using them. Drag control can be manually adjusted and locked, along with independent panning. The ballhead can be moved freely, allowing the mounting platform to be positioned between 0-90 degrees vertical orientation, yet can be smoothly locked quickly with the Head locking knob, important creating panoramic photos. The Globetrotter in aluminium uses the Arca Swiss quick release plate, which are industry standard and the quick release locking knob work smoothly together. I like the fact the plate has two screws that sit in grooves either side of the mounting platform, as it adds a little extra security when releasing the quick release-locking knob. Tilt and twist to fully release and remove the plate and camera. If you are looking for a solid, well built good looking tripod at a fantastic price point around $395/$430 (I’ve found for online and in store) then the MeFOTO Globetrotter tripod in aluminum could be just the tripod for you, I would happily have this as my everyday tripod. If you want to get away from the standard ‘black” colour tripod then there’s a few of colours to choose from, including black. I’ve used the Globetrotter in aluminium with my Canon 5D MK IV, Canon 24-105mm f/4, Tamron 15-30mm f2.8 and Samyang XP 14mm f2.4 lens and on each occasion my kit has performed, as I would have hoped for. I am a big advocate for using the “hook” and hanging your camera bag from it for extra stability but even without doing this the tripod is a very solid performer. Price $395-$430 for a tripod that can carry up to 26.5lb or 12kgs of camera and gear that’s fantastic. For a tripod that has flexibility of a monopod option, height of 1630mm fully extended it only weighs 4.6lb or 2.08kg that’s pretty light weight. (NOTE: for me I didn’t overly notice the weight difference between the Carbon Fiber version vs the Aluminium. But if you do or are planning on hiking a distance regularly or travelling where airlines charge like wounded bulls on excess baggage then spending the extra on the Carbon Fiber could be a big plus). Ease of operation - half a turn to unlock and lock legs for quick set up or pack up and each operation is a smooth motion. Centre column has a tongue and groove adding extra rigidity. Quick to set up: 30-40 seconds from unzipping the bag, unfolding the legs, extending and tightening the legs, and attaching to my camera via the quick release plate. Colours! I’ve been using the Green but the Red is very eye catching! You don’t have to be a professional photographer to own this tripod but for many professionals the Globetrotter in aluminium could be a fantastic addition to their gear. If you were starting out and wanting your 1st - 2nd - 3rd tripod then I’d strongly consider checking out the MeFOTO Globetrotter. At a photography meet up, Nick from Nick Dobinson Photography. (on Facebook) borrowed the Globetrotter in aluminium from me for the afternoon and evening. Nick loved how much lighter it was to use than his current tripod, yet was sturdy when shooting with his Canon 6D and 18-200mm lens on it with a decent offshore breeze. If buying a new tripod he would strongly consider the Globetrotter in aluminium. As I’ve mentioned in another review for the Globetrotter in Carbon Fiber, which uses the same system, I think the bubble level could have been moved off the top plate. This would make it more accessible when the camera and lens are mounted on the head for panoramic photos, but many people use attachment levels that lock into the hot shoe. With the leg locks just don’t over-tighten them, about half a turn has them locked into place ready to go and I always remember the saying ‘righty tighty, lefty loosey’ as in the dark you don’t always want to be turning on a torch when adjusting your tripod. For many photographers, packing a tripod is just as important as a camera and lens. I was sent the MeFOTO Globetrotter Tripod in Carbon Fiber to test out and have since become a MeFOTO Ambassador, so for the past 3-4 months I've been using it as much as possible when out shooting. 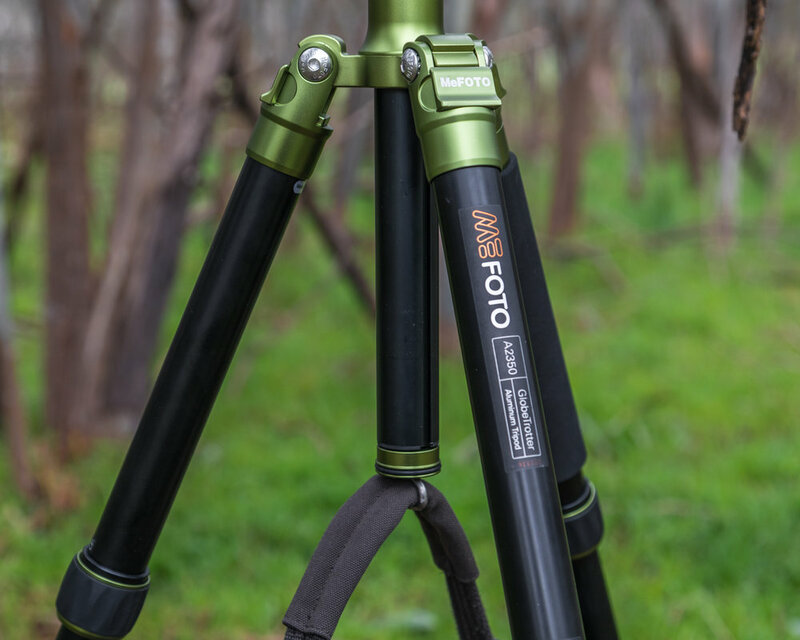 MeFOTO tripods are made in China and manufactured by Benro Precision Industrial; and were introduced into the market to offer a sleek designed, more compact, lightweight, and colourful tripod range that come with a three year warranty. I always have a tripod in my car for work or ready for those emergency amazing-sunset-on-the-way-home-from-work moments, and only on very rare occasions will I leave the house without one when I have my camera on me. The reason being that a tripod helps support my camera, which allows me to shoot in many different situations, such as high speed photography, long exposures, low light situations, macros, among many others. When the camera is stabilised, more time can be spent in framing the subject (nature landscapes, architecture, models, etc) and get things 'right in camera' - leading to quicker processing times when back behind the computer. Furthermore, in today's camera market where the use of natural density filters is rapidly growing, a sturdy tripod has become so much more important for long exposure photography; or with big telephoto lenses designed for motorsport, bird watching or capturing a full moon. MeFOTO Australia and Samyang Australia teamed up with Igersmelbourne in June for a photography instameet at Gunnamatta Ocean Beach along the Mornington Peninsula, where I used the Globetrotter on a number of uneven surfaces (sand, rock, timber decking, etc). I used varying camera settings of up to 30 seconds to capture sunset, astro, and light-painting; and despite there being a breeze that night, the tripod performed perfectly and resulted in clean and sharp images. I have also been shooting around Melbourne's CBD using the Globetrotter at sunset and in the evening for long exposure and bracketing. Click here to view an image from that night. I have also recently been using the tripod for time lapses on the Mornington Peninsula at sunset and up at Mt Donna Buang in the snow. Straight out of the box, there's a handy snug carry case with a shoulder strap and a zip pocket inside that contains an allen key and a set of spiked feet. Inside sits the Globetrotter Carbon Fiber tripod that can handle up to 12kgs of camera, lens and accessories; featuring a minimum height of 409mm, a maximum height of 1630mm, and its lightweight carbon fiber material means it only weighs in at a tidy 1.7kg. Also included is a double-action ballhead and quick release Arca-Swiss Style plate. Bonus feature: the tripod can convert into a monopod in around 30 seconds without needing to mess around with any tools. Having five leg sections and two leg angle sliding lock positions, the Globetrotter allows for some fantastic height adjustment which helps when on unlevelled surfaces such as rocks, sand or getting low to the ground for say macro shots. MeFOTO top it off with supplying two sets of feet - the rubber ones which are what is on the tripod out of the box, and a set of metal spike feet which are great for soft ground surfaces. The leg lock grips require a half turn clockwise, which allow free movement to adjust your tripod to the required height, easy set up. Follow by an anticlockwise half turn to lock the tripod legs away. Ensuring the legs are locked in is simple with the leg angle lock on the centre spider/tripod body. From my experience so far, the leg adjust system keeps out unwanted elements. I have found the legs smooth to operate with a comfortable tactile response with just enough friction. A huge bonus is that one of the carbon fiber legs on the Globetrotter can be removed and with the detachable centre column and become a monopod, which has a useful handgrip. The monopod allows for great height flexibility too - I'm 183cm tall and even I don't need the monopod fully extended to use! MeFOTO use a reverse folding leg system that makes this tripod very compact; after extending the centre column, the legs then reverse to fold up around the column then ready to pack away. A centre column is extremely important on a tripod, however in the past I have been reluctant to extend the column on some tripods, as I was certain I'd get camera shake whenever there was a slight breeze. This hasn't been the case with the Globetrotter Carbon Fiber column - it looks sturdy, and it is sturdy. One of the first things I noticed when using the tripod was the tongue and groove running up the column, which I believe adds a huge amount of strength and rigidity that is so important when out in the field. There is also a spring-loaded hook at the bottom of the center column for adding extra weight like a camera bag. Made of magnesium alloy, it looks and feels well-made. The leg locks work effortlessly, and once disengaged (if in use), it allows for the reverse folding carbon fiber legs to be placed into position; folding away to a compact 420mm in the handy carry bag. Let's not forget here about the tongue and groove incorporated in the Center Column Locking Collar. I've spoken about the correlation between the tripod body and centre column - these two components are integral in firming and creating great stability, particularly when extending the centre column up to reach 1630mm height. An Allen key is supplied for basic cleaning/maintenance. The MeFOTO Q2 double-action ball head has three operating knobs: 1) Head locking knob; 2) Drag control knob; and 3) Pan locking knob. The grip on each feels great and has small ridges which mean your fingers don't slip while using them. Drag control can be manually adjusted and locked, along with independent panning. The ballhead can be moved freely, allowing the mounting platform to be positioned between 0-90 degrees vertical orientation, yet can be smoothly locked quickly with the Head locking knob, which is important if you want to produce panoramic photos. It comes with the industry standard Arca Swiss quick release plate and the quick release locking knob work smoothly together. I like the fact the plate has two screws that sit in grooves either side of the mounting platform, as it adds a little extra security when releasing the quick release-locking knob. To use it, it's simple - just twist the knob to half release and allow the plate and camera to be moved sideways and to the centre of the mounting platform; tilt and twist to fully release and remove the plate and camera. There is a bubble level and has 360 panning indicator numbers are easy to read. Separate head and pan lock are user-friendly additions on this tripod. The MeFOTO Globetrotter Carbon Fiber Tripod is a very good-looking tripod and kit, with an array of colours available. My two favourite things about this product include the ease of operation and its flexibility. I can grab all leg locks in one hand and give them a half turn to unlock it, and extend the leg out in one motion with ease. Moreover, the spiked feet and monopod options make it a handy piece of equipment that is perfect for amateur photogs who want a great first tripod; or for professionals who require something with a bit of versatility and strength to hold heavy camera equipment. You should be able to pick up a Globetrotter in Carbon Fiber somewhere between the $630-$700 mark online or at your local camera store (if they don't stock it, they should. Ask them to order you one in). The Globetrotter Carbon Fiber is a great pairing with my Canon 5D MK IV / Samyang XP 14mm f2.4 or heavier Canon 70-200mm f2.8. I have used it while out on beaches catching sunsets, on rocky cliffs doing astrophotography, and I've been on the streets of Melbourne CBD and Docklands at night taking long exposure photos. It's on par with more slightly more expensive tripods I've used, and better than some others I've used that were around the same price or marginally cheaper. It’s quick to set up: 30-40 seconds from unzipping the bag, unfolding the legs, extending and tightening the legs, and attaching to my camera via the quick release plate. Adjustments are easy for framing subjects and I really love that the centre column construction uses a tongue and groove, which I'm sure adds to the strength and rigidity of the overall tripod. Those colours! Now while I am using the black Globetrotter Carbon Fiber tripod, I also have the Globetrotter in aluminium with green trim, and the RoadTrip aluminium with orange trim, but really wish the titanium colour were in stock when I was sent out the tripod to review. Any negatives? No, not from my perspective, I think the bubble level could have been moved off the top plate, making it more accessible when the camera and lens are mounted on the head for panoramic photos, but many people use attachment levels that lock into the hot shoe. I would just like to remind people to not over-tighten the leg locks. If like me you have the quick release plate attached to your camera, make sure it is tightly attached, in my excitement to take a few shots when the tripod first arrived, I only 'finger tightened' the plate and had a few portrait orientated photos blur from slipping ever so slightly. Sign up with your email address to receive news, reviews, upcoming workshops and sale events. Thanks for subscribing ...have a great day!